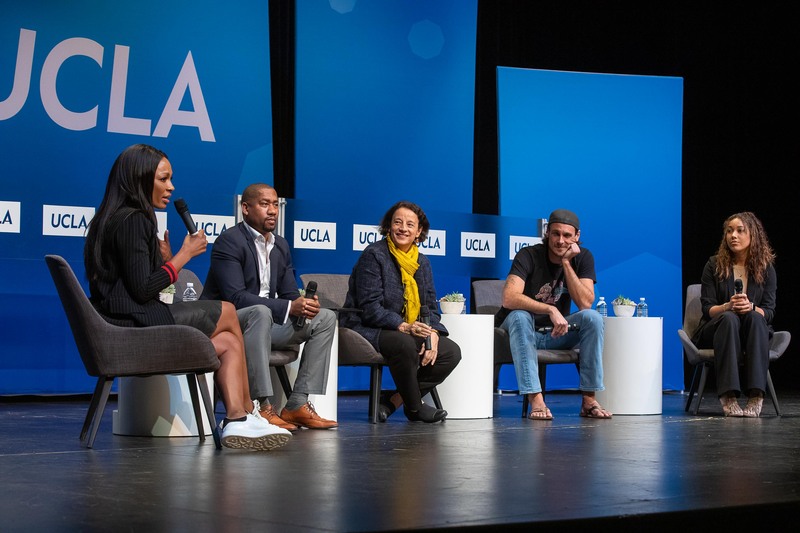 On February 5, 2019, UCLA commemorated the 100th anniversary of the birth of Jackie Robinson with a panel entitled Athletes, Activism and Jackie Robinson’s Legacy. Moderated by Bruin alum Cari Champion, co-anchor of ESPN’s SportsCenter, other panelists included triple Bruin Damion Thomas, Museum Curator for the Smithsonian Museum of African American History and Culture; Patricia A. Turner, Dean and Vice Provost of Undergraduate Education at UCLA and coordinator of the Arthur Ashe Legacy Fund; alum Chris Kluwe who played football for UCLA and then the Minnesota Vikings, and Kaiya McCullough, current student-athlete and political science major. References to Arthur Ashe, who often noted that the fact that UCLA was Jackie Robinson’s alma mater was very influential in his decision to become a Bruin, were prominent in the stimulating discussion of the ways in which athletes have distinguished themselves off the field with their contributions to social justice.